I think at some point or another, we've all had run ins with sociopaths - people who get into your head, maybe seem innocent, but simply want to manipulate you for their benefit. Fill in the blank. "Enamored with me." "Jealous." "Crazy." "Bipolar." Whatever. Sociopaths often get down in the gutter and resort to name-calling to diminish your self-worth and make you insecure. By bringing you down, they bring justification to their unhealthy behavior and keep you hooked on them. 02. "You just didn't understand me." 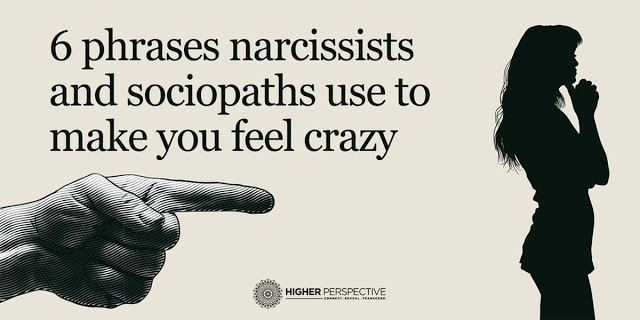 Sociopaths will do something often referred to as "gas lighting," which is when you do something that causes a negative reaction then blame the person for their negative reaction, saying that they didn't understand what you were trying to say. 03. "Stop being so sensitive." When a sociopath pushes your button and makes you mad or elicits another negative creation from you, they'll defend what they said or did by telling you you're too sensitive. You need to "toughen up." This is, of course, a way for them to excuse themselves of any guilt and keep you hooked on them. When a sociopath accuses you of being dramatic, you're trying to remove any validity from your emotions and reactions that might exist. They're simply trying to tear you down and make you second guess how it is that you actually feel. 05. "You're reading too much into this." There are most definitely times that we read too deep into things and take away things that were never actually there, but sociopaths often do things to make you on edge or paranoid - really anything to make you question their motives, all in the hopes that they can belittle your intuition and make you feel crazy. 06. "You'd never survive without me." Once you've begun to deconstruct a sociopath, the baser form of their manipulation begins to surface. What they want with you isn't a healthy relationship, be it platonic or otherwise. What they want is control over you, and they control you by making you feel like you're crazy. Don't let them get away with it. You can survive without them.